How to Choose the Proper Grout and Tile Sealer for Your Restaurant – Mees Distributors, Inc.
Once you finish laying down a new tile floor in your restaurant, you will want to seal it. Protecting the tiles and grout lines is the critical last step in the installation process. A properly sealed tile floor is better at resisting stains and can help keep odors from permeating into your flooring. But there are a lot of different sealant brands available and choosing the right grout and tile sealer for your restaurant floor can be difficult. Here’s what you need to know before choosing your grout and tile sealers. There are two main categories of sealants — surface and penetrating. Each of these types fills a specific role. To get the best results, you need to choose the right one for your floor. Penetrating sealants are great for tiles which are more porous. This type of sealant soaks into your tiles and grout lines to protect against stains without changing the appearance of your floors. Surface sealants, on the other hand, lay flat on the surface of a tile floor and offer not only protection but a shiny look to your floor. Some people refer to surface sealants as tile enhancer. 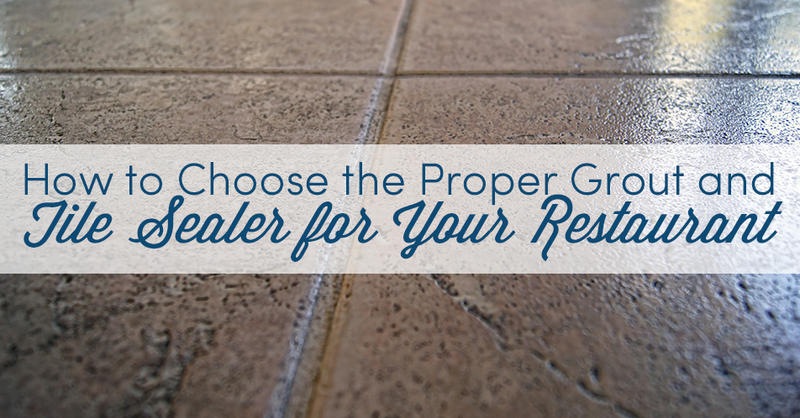 The type of tile and grout sealer you choose depends on your tile’s material. Although most glazed porcelain and ceramic tiles do not require sealing in a residential setting, in the high-traffic and abusive environment of a restaurant, it is still a good idea to seal these types of tiles with a small amount of penetrating sealant. When you are using unglazed tiles, a sealant is a must. Natural stone and unglazed porcelain tiles always need sealing with a penetrating sealant before grouting can begin. Otherwise, the grout can bleed into the tiles and stain them. It is necessary to seal decorative, handmade tiles with a fair amount of penetrating or surface sealant. There are multiple ways to apply tile and grout sealant to your tile floor. Therefore, you may want to know the best application method for each sealant before making your purchase. Some types of sealants require much more time for applications and drying than others. Depending on your time frame, this may be an important factor in making your decision. Is it time for you to replace or repair your restaurant’s tile floor? Mees Distributors, Inc. is one of the most trusted tile distributors in the Midwest. For over 80 years, business and homeowners have trusted Mees Distributors, Inc. with all of their tile and stone floor needs. Contact a flooring expert online or visit a showroom in either Cincinnati or Dayton for a complete selection of tiles, grout, and sealants.